Do people really care about the appearance of their workout equipment? Think about it. What do you usually do with your bulky workout equipment once you have finished using it? You put it up, right? It doesn't exactly match with your home décor, so you put it under your bed, in your closet, in a corner, in the garage. Once it's out of sight it's also out of mind. In an attempt to solve these issues designer Alex Undall has turned an ordinary dumbbell into a house decoration that has multiple uses. The Crystal Dumbbell is a colorful hand weight made of glass that can pump up your arms and then decorate a nice shelf in any room. It even comes in different colors. 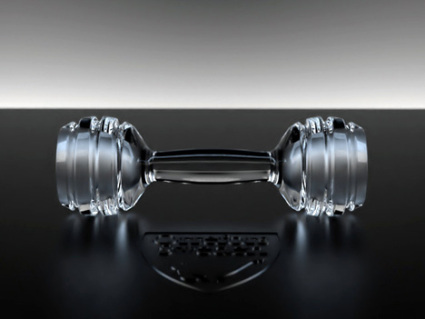 "The aim is to have the Dumbbell produced by a high end glass producer that would raise its status to the same level as other high end home interior decorations, thus adding value and giving the customer more then one reason to by a fitness product." So what do you think? Is it this an innovative concept or just a good waste of glass? What if it was made it out of recycled glass? Fitness is never going to look the same again. The dumbbells are really cool! I say they are worth the purchase. Not sure a man would care, but I'm all about the look and feel. It's more motivating to step into a workout room with pretty equipment. Glass? Are they insane? Every now and then, you DROP the weights you work with (or, worse, smash them together). Steel can stand up to the punishment, but glass will eventually shatter (and fling some pieces in your eyes if you aren't lucky). All of the dumbbells you've ever seen are made from resilient materials (plastic coated or metal) for a reason. As suggested above, they get knocked into things. Resilient materials absorb the blows. Metal ones might get nicked, but they don't break. 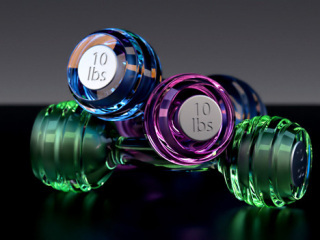 Glass dumbbells is, indeed, a silly use of glass.